For your holiday cottage in Sussex  find your perfect holiday rental property in Holidaycottages.cc or by searching this website, then contact the owners direct, to arrange your booking. As a cottage holiday destination Sussex may not be an obvious choice but, from the rolling hills of the South Downs, to the city of Chichester, or the coast and beaches of places like West Wittering, Sussex has plenty to attract. 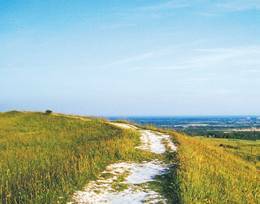 Peter Henshaw took a holiday cottage in Sussex and set out to discover what the county has to offer as a holiday destination. We were walking over the South Downs when it happened. Admittedly, there had been a clue. Why was an isolated car park atop the Downs full to overflowing? We'd seen maybe half a dozen other walkers, but it was as if half the population of West Sussex had chosen this particular weekday to go for an evening stroll. Puzzled, we carried on climbing the chalk ridge. This could only be England  a lark trilled its way into the cloudless blue sky on what was a perfect summer evening, and from the top of Roche Hill, the flat coastal plain was laid out before us like a map. Chichester at our feet, and along the coast, Littlehampton and Bognor. The sun, still high at six o'clock, glinted off the Channel and behind us, the South Downs rolled off to the horizon. Holiday Cottages database by county or by specific location.